Sur Jahan, earlier known as Sufi Sutra, is a World Peace Music Festival ‘Music for All, Music for Peace’ is the mantra of this non-commercial festival that celebrates cultural diversity. Termed as a ‘people’s festival’ by the media worldwide, Sur Jahan has evolved as a Headliner Festival in both Kolkata and Goa. 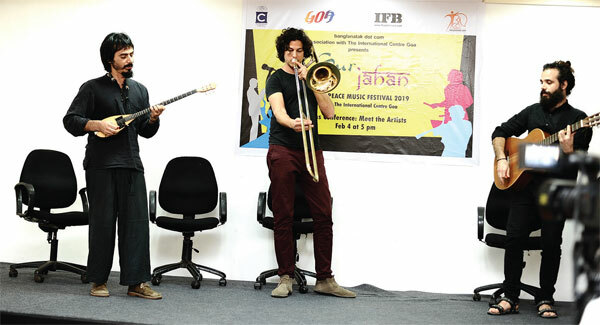 This year, six international music bands, namely, Mario Lucio (Cape Verde), Babra (Hungary), Liona and Serena Strings (Spain), Madagan (Northern Ireland), Mawlawyiah ( Egypt) and Monsieur Doumani (Cyprus) and others will perform at the three-day festival at the International Centre Goa (ICG), Dona Paula. Dr Pushkar Sinha, Director, ICG expresses his happiness of being able to host the prestigious music festival. There will be six stalls of Goan handicrafts displayed at the ICG venue. Emphasising that the festival is about music, peace and love, founder-director, Banglanatak.com, Amitava Bhattacharya spoke about the key features of the festival, such as its use of ethnic traditional acoustic instruments, the variety of music, good vocals and dance that adds colour to the festival. Apart from the evening performances, there will also be daytime workshops by the performers that will enable the audience to experience and interact with the performances on a more personal level. As past editions have shown, they also provide interesting opportunities of collaboration among participating groups and artistes, leading to an integration of cultures and a vibrant assimilation of various music genres. The festival ends with members of all the teams coming together to jam and create a unique melodious crescendo. Amitava praised the WOMEX lifetime award winner from Cape Verde, Mario Lucio who will be performing with his band. “Mario’s talent as a musician was noticed when he was 12-years-old; he would play several instruments, write poems and compose lyrics. He is also a lifetime researcher of traditional music, an activity which provides modernity, originality and poetry. His performance is one to watch out for at this festival,” says Amitava. “Babra is a band that has performed at several festivals such as Bela Bartok National Concert in MUPA Palace of Arts and has played at Hungarian Showcase Day as a part of WOMEX 2015 in Budapest, and is something to lookout for. Also, Bengal Goa Musical Ensemble collaboration will bring folk music and artistes from both Bengal and Goa together,” he adds. The festival will be inaugurated at ICG’s Kaz Lawn at 6:30pm followed by the concert by Babra (Hungary) at 7:30pm and Mawlawiyah (Egypt) at 8:30pm. On Day 2, Liona and Serena Strings (Spain) will perform at 6:30pm, followed by Bengal Goa Ensemble (India) at 7:30pm and Mario Lucio (Cape Verde) at 8:30pm. On the last day of the festival, Madagan (Northern Ireland) will have their concert at 6:30pm, with Monsieur Doumani (Cyprus) at 7:30pm and the closing ceremony at 8:30pm. Showcasing of rural handicrafts will happen on all three days of the festival, from 4pm to 9pm at the poolside at ICG. The festival is non-ticketed and open to all.